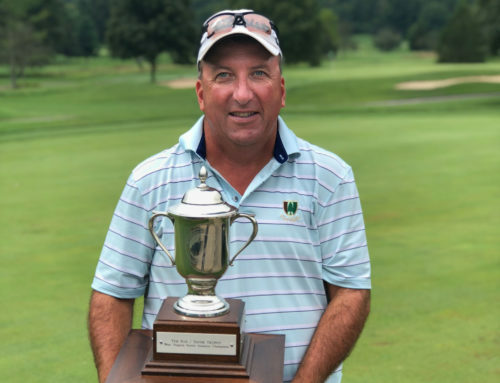 Canaan Valley, WV – The 56th playing of the West Virginia Senior Amateur Championship concluded on Friday at Canaan Valley Resort. Wind and rain swept through the valley for the majority of the day making conditions difficult for the remaining players who have survived their respective match play brackets. The first match off at 8:00 am was the Gold Division Championship Match, pitting Stroke Play Champion and number 1 seed, John Cleavenger of Lumberport, against defending Gold Division Champion and number 2 seed, Ben Watson of Daniels. The match-up proved early to be a fair one as Watson held only a 1up lead thru the first 9 holes. The second nine was a different story, though, as Watson began to run into trouble with his game and Cleavenger capitalized on his misses. Cleavenger won holes 10, 12, 13, & 15 to gain complete control over the match and walk to the par-3, 16th with the match status dormie. The match would end on the 16th as both made par and Cleavenger closed the match 3&2. Following their match were the semifinal matches in the Silver Division. 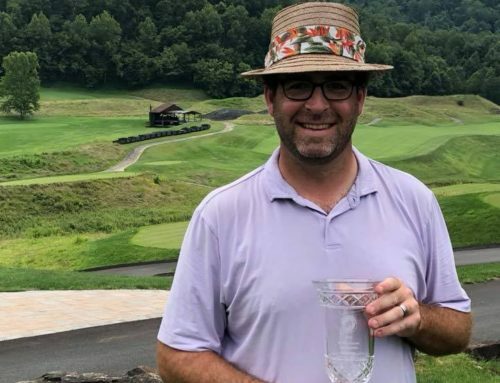 Stoke Play Champion and number 1 seed, Jim Cyrus of Huntington, played George Hemelt of Morgantown and Jim Carpenter of Martinsburg faced Rick DeGroff of Montrose. The Cyrus/Hemelt match was AS thru the first 6 holes as neither player showed signs of budging. Cyrus would win the 7th and 8th to take a quick 2up advantage, but Hemelt would win the 9th to bring the lead back down to 1up at the turn. The match turned Cyrus’s way on the 12th as he would win the hole, win the 13th, and close the match on the 15th (5&4) with a par as Hemelt got too aggressive with his birdie putt and missed the chance for par coming back. In the other match, Rick DeGroff got the match off to a hot start with his birdie on the first hole to take a 1up lead, but Carpenter was not dismayed as they tied the next two and he won the 4th to bring the match back to AS. Carpenter would go on to win the 7th and 9th to take a 2up advantage. From there the two traded a couple of holes on the inward nine, but ultimately Carpenter was able to close the match 2&1. 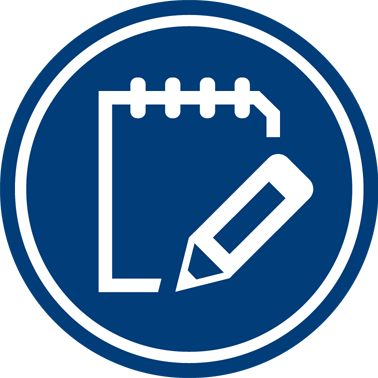 In the Championship Division, both matches went the distance. The first match off was that of Harold Payne versus Chuck Ingram. After splitting the first four holes, Ingram won the 5th hole to move to 1up. The lead was short lived, though, as Payne got it back to AS on the 7th. From that point, Payne would win holes 10 and 13 to take a 2up advantage on to the 15th where Ingram would win the hole. Payne would hold the 1up advantage for the next two holes before facing the difficult 18th. Payne found some trouble off the tee and with a difficult lie, had to lay-up short of the water on the par-4 as Ingram would put his second shot onto the back of the green. After Ingram’s two-putt par, Payne faced a 15-footer downhill to win the match and it found the bottom of the hole. Jeff Harper and John Duty, Sr. also would face the 18th hole. 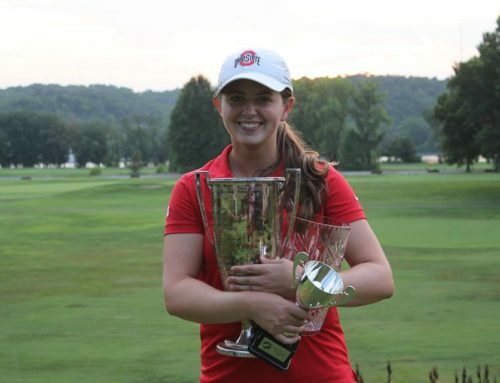 Harper got out to a big lead early, leading Duty, Sr. with a 3up advantage thru 9 holes. Duty, Sr. would battle back with a birdie to start the inward nine on 10 and a par on 13 to get the match back down to 1up in advantage of Harper. It began to look like extra holes on 18 as John Duty, Sr. eyed a short putt to win the hole, but it just missed high and Harper would win the match with a final of 1up to set-up a rematch of last year’s Championship Match with Harold Payne. The afternoon matches began with sides on each match trading pars on the first two holes before heavy rains and unplayable conditions would delay both matches. Once matches resumed, Jim Carpenter would strike first in the Silver Division with a par on the par-3, 4th to win the hole. Carpenter and Cyrus traded blows for the rest of the front nine as winds and off & on rain continued, but they made the turn with match status at AS. Following the delay, Jeff Harper was able to birdie number 3 to take a 1up lead on Harold Payne. Harper’s lead did not last long as Payne would win holes 4-7 under difficult conditions to take a 3up lead in the match. After splitting #8 with pars, Harold Payne won #9 with a par to take a commanding 4up lead to the last nine holes of the championship. 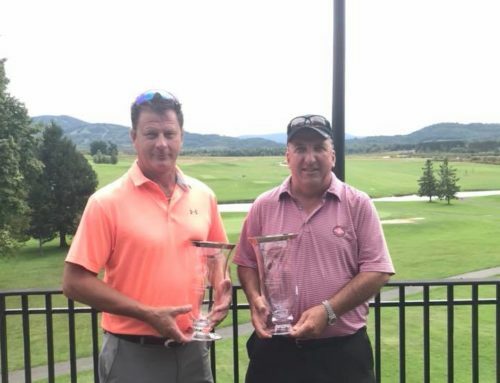 Jim Carpenter and Jim Cyrus continued their back and forth battle for the Silver Division title. Cyrus got out to a 2up lead thru 13 holes, but Carpenter won the 14th with a birdie and the 15th with a par to bring the match back to AS. After halving the 16th hole, Cyrus won holes 17 and 18 to close the match 2up. Payne continued his solid play on 10 and 11, matching Harper with pars before winning 12 with a par and 13 with a birdie to close the championship match at 6&5. This victory for Harold Payne makes him a three-time champion of this event. 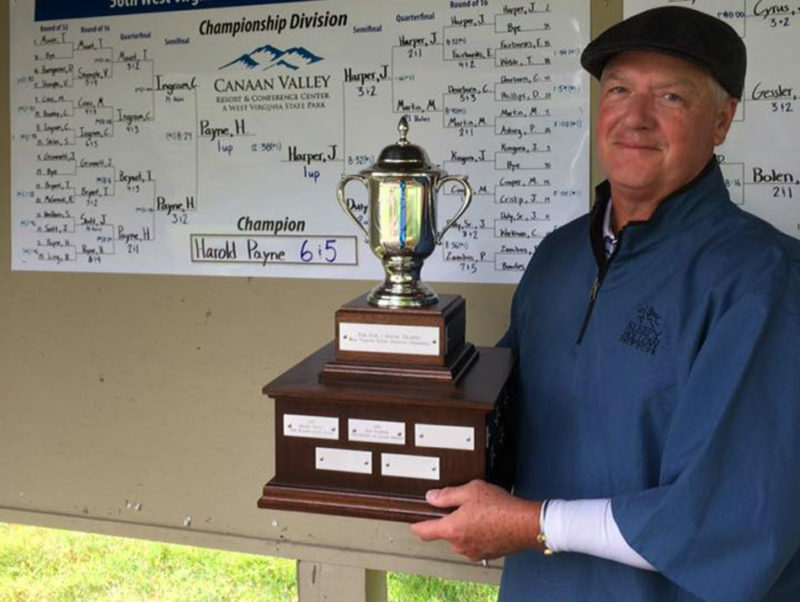 The West Virginia Golf Association would like to congratulate all champions and send a special thank you to Canaan Valley Resort for hosting a great state championship! 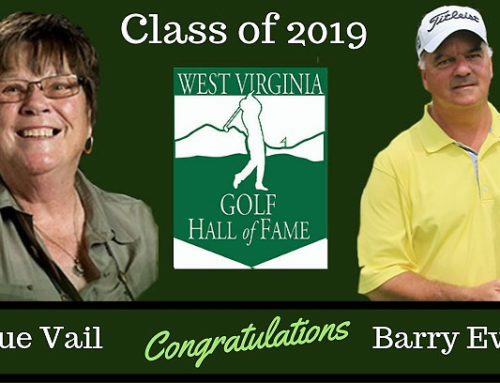 For more information, please visit wvga.org and follow the WVGA on its various social media platforms.